My Dad, Clifton “Jerry” Noble Sr., was so pleased when people told him they enjoyed reading his articles in Southwoods Magazine. He always wanted to be a writer, so it was a dream come true for him when Carole and Buzz Caron began publishing his biographical articles in 2003. He loved writing articles to share his stories each month. Dad passed away on December 16, 2016 at the age of 90, just two weeks after finishing his article for the December issue. We thought that would be the last one of his stories to appear in Southwoods, but Carole and Buzz had other ideas. They knew Dad kept detailed diaries and had a large collection of photos and news stories from the 1940s to the present. They asked us if we would be willing to use those resources to continue telling the story of his life. How could we say no? Starting next month, my wife, Kara, and I will become his “ghost writers.” But before we resume the story of his life in the 1960s, we wanted to share a snapshot of how we saw him. This article is excerpted from the eulogies we gave at his funeral on December 21. I first met Jerry Senior when I was in college. His son—my future husband—brought a couple of us from school to see his home and meet his folks. His Dad opened the door to greet us wearing only a leopard print Speedo bathing suit. Dad was always a sun worshipper. He would say he could usually start working on his tan by his birthday—March 24. From then until the last equally warm sunny day in autumn, he would be out in the sun as much as possible. He worked hard to keep a trim, muscular figure, and he liked to get as much of it in the sun as he could as often as possible. People driving by would see him mowing the lawn in a Speedo and Converse sneakers until he was well into his 80s. Everybody in his adopted town of Montgomery knew him—and not just because of that bathing suit. He helped neighbors push cars out of ditches and gave people rides to town. He loved his hilltown home and worked hard to stay on good terms with everyone else who lived there—and they really liked him. That’s a major accomplishment in a small town. He was also an obsessive-compulsive detail guy. He wrote down everything. Facts were important to him and it was vital that they be correct. To him, if a thing was worth doing, it was worth doing right and all the way to the edges. He carried a journal with him everywhere so he could document facts as he moved through his day. Those journals include all the facts he thought were important, from the price of groceries to the exact time he arrived at the coin-op laundry every morning. National news rarely made it in. It’s all local, all the kind of personal facts he has long shared in his Southwoods articles. He hated to waste anything, especially time or space—which is why everything he wrote down is nearly microscopic. They are also so filled with abbreviations—to make more fit on each page, you know. That it can be quite a task to translate them from “Jerry” into English. Dad surrounded himself with forests and fields; he loved to walk in the woods. He created a system of trails so he could walk on his beloved Montgomery Mountain, and we still use portions of them for walking and horseback riding. When he was walking in the woods, he could outpace us younger folks easy. On snowy Sundays, when it was safer to walk than to drive, he would hike from his home to the Community Church. The trip was about 2 miles—straight up, often through heavy snow. At least once, he made the trip carrying his young son on his shoulders. 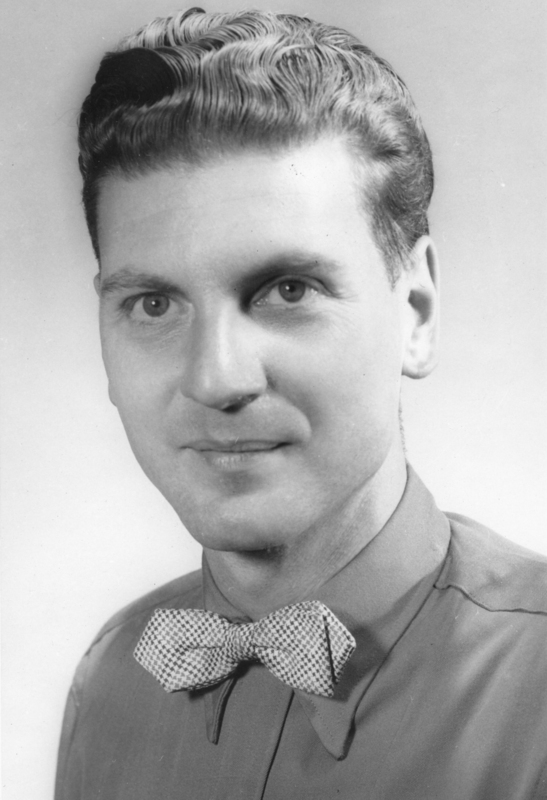 He loved the church, and its music—especially playing the organ and directing the choir. He always had a church job. The denomination was flexible. He played for the Christian Scientists, for Congregationalists, for Baptists, for Episcopalians, and most recently for the Southwick Methodist Church. 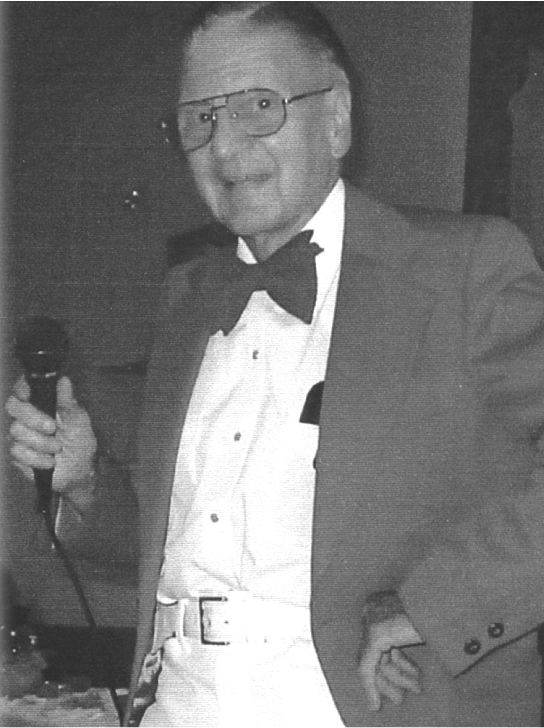 He was a born performer, and he was happiest when he was making music for church, presenting puppet shows at the library, making home movies with his son and granddaughter, or singing and tap dancing at lunches and teas at local senior centers. 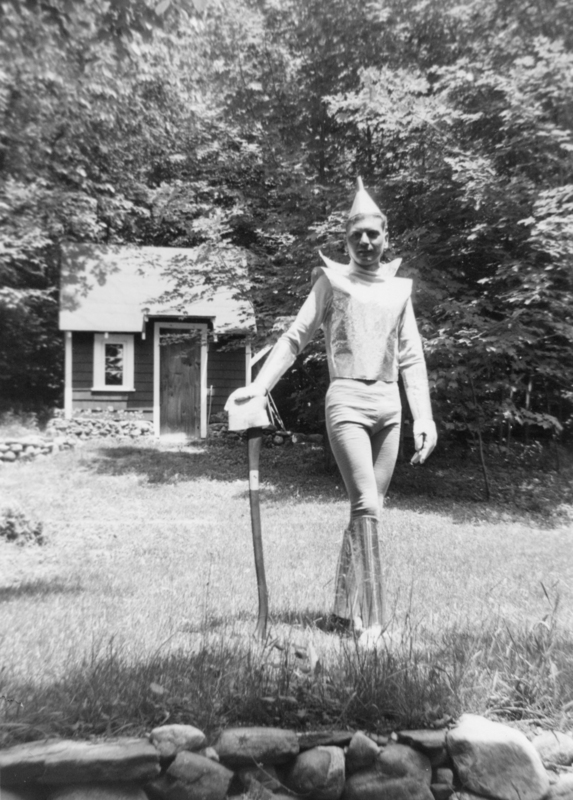 He was hugely proud of the fact that he played and danced the role of the Tin Man in a production of the Wizard of Oz presented by the studio where he took tap dancing lessons back in the 50s. My dad taught me to read music when I was 4 years old. He bought me a ukulele for Christmas and showed me how to read the dots on the lines of a musical staff and translate them into sound on the strings. A year later, realizing that I had a talent and an ear for music, Dad bought me a piano, and helped me to learn Bach’s little Menuet and several other graded pieces. He gave me a nickel for each song I memorized and wrote “5 cents” in pencil at the top of the page, so I could keep track of my progress and my finances. I read through Dad’s music collection from Stephen Foster songs to Beethoven sonatas. Dad would write little tunes at the piano also, and he made sure there was manuscript paper handy when I began to try to write my “Symphony No. 1” and other one-page hits in ungainly lollipop-shaped notes. Although Dad was a civil engineer by trade, music was a big part of his life, and he always told me I could do a lot worse than be a musician. “People will pay to be entertained,” he said. Having grown up in the Depression, he knew it to be true. Dad was the organist and choir director at the Montgomery Community Church while I was growing up, and even though my legs weren’t long enough for my feet to reach the bass pedals of the organ, he showed me how to work that instrument too, and eventually I grew into it. Kara and I drove him to church every Sunday and he played until the week before he died. 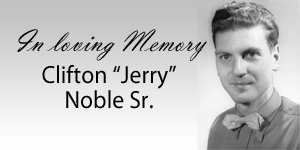 Clifton “Jerry” Noble, Sr. was a unique person who touched everyone around him in a unique way. Some knew him as an engineer and draftsman. Some knew him as an organist and singer. Some knew him as a writer. Some knew him as Dad, Grandpa, Uncle, Cousin, In-Law. Whoever he was to you, we’re sure he gave you something you’ll always remember. When you do remember it, we’re also sure you’ll think, “That was memorable.” He was quite a unique guy.